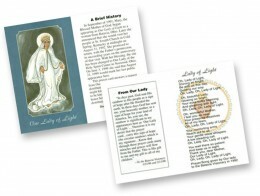 This 2 1/2″ x 4″ card fits easily into pocket or purse. Featuring the Lady of Light song, it also gives a brief history of the appearances of Our Lady to the Batavia visionary. See Image/Card page.